The first major narrative cycle in Mark’s gospel (1:16-3:6) ends with Jesus’ rejection by the authorities in a Capernaum synagogue. The following episodes serve to regenerate the story by a withdrawal and summary scene (3:7-12) and then by a reconsolidation moment (3:13-19a). The latter mountaintop scene boldly re-contextualizes two of the most revered traditions of Israel: God’s covenant with Moses on Sinai, and Moses’ founding of the free tribal confederacy in the wilderness. Jesus, who has taken the torch from the prophets, prepares to pass it on to twelve disciples he has called, named, and commissioned to proclaim, heal and exorcize (3:14f). Shortly they will be sent out to practice this charge – a second regenerative episode that follows upon another synagogue rejection (6:1-13). Mark recognizes that the two pillars of communal authority, the clan and the State, work together to domesticate people under the status quo. Let us look at each in turn. A: In the ancient Mediterranean world the kinship system determined personhood and identity, controlled vocational prospects, and facilitated overall socialization. Jesus’ family sought to reign him in no doubt for his own protection as well as for the sake of their reputation. In 3:31, after his clash with the scribal investigators (B), family members redouble their efforts to restrain Jesus. Mark underlines this tension spatially: contrary to what we would expect, the disciples and the crowd are “inside” the home, while the family is “outside” (3:32). Jesus understands that in order to weave an alternative social fabric, the most basic conventions and constraints of kinship must be questioned: “Who are my mother and my brothers?” (3:32). He concludes the scene by redefining family as “whoever does the will of God,” a radical proposition in any cultural system (3:35). Both the private sphere of the clan and the public sphere of the State equate personal sanity and political sanctity with maintenance of the status quo. Smarting from Jesus’ repudiation of their authority (1:22ff; 2:6ff), the scribes attempt to undermine Jesus’ popular standing by charging that he is in the service of the “prince of demons.” It is a predictable strategy of threatened political leaders: neutralize the opposition by identifying them with the mythic arch-demon (in modern America this would be tantamount to calling Jesus a “terrorist”). Jesus’ deviant practice of exorcism, which liberates people for Jubilee and retribalization, is dismissed as either lunatic or traitorous. Here and elsewhere in Mark, Kingdom (see 6:23; 11:10; 13:8) symbolizes the centralized State, and House (see 11:17; 13:34f) its symbolic center, the Temple. Jesus is thus returning the scribal “compliment” by aligning their social order with Satan. Mark chooses this acrimonious debate to introduce Jesus’ discourse of parables (3:23). Parables were understood in Jewish tradition as metaphorical stories with thinly-veiled political meanings (see Num 24; Ezek 17). In fact, the most well-known parable in the Hebrew Bible concerned a king’s abuse of power: Nathan’s unmasking of David’s murderousness (2 Sam 12:1-15). Jesus’ parable here makes his subversive intentions clear, likening his mission to a thief who “must bind the strong man in order to ransack the goods in his house” (Mk 3:27). This trope will emerge as one of the gospel’s master metaphors. Later Jesus will “break into” the Jerusalem Temple, “cast out” the true thieves, and put a ban on the “goods” of that “House” (11:15-17). He will insist it “cannot stand” (13:2) and exhort his disciples to keep watch over the House as it awaits its true Lord (13:34f). However unsettling Jesus’ metaphor of criminal breaking-and-entering may seem, the metaphorical tradition comparing the Lord’s advent to “a thief in the night” was one of the most enduring in the early church (see e.g. Mt 24:43; I Thess 5:2,4; II Peter 3:10; Rev 3:3, 16:15). The answer to the riddle of whether Satan can cast out Satan, then, is that Jesus (a.k.a. 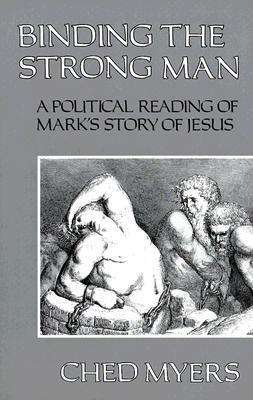 the “stronger one” heralded by John the Baptist in Mk 1:8) intends to overthrow the “Strong Man” (a.k.a. the scribal establishment represented by the demon in 1:24). Mark appears to have taken his cue from Isaiah’s oracle: “The captives of the strong one will be liberated; the prey of the tyrant will be rescued” (Is 49:24f). The true political geography of Jesus’ apocalyptic struggle with Satan (see Mk 1:13) has now been revealed. Jesus’ vision of the Kingdom challenges both the domesticating family and the dominating State. No wonder radical discipleship remains marginal in our churches!